Google have teased the idea of a game streaming system for a few months and it has now been confirmed when they officially released Stadia. 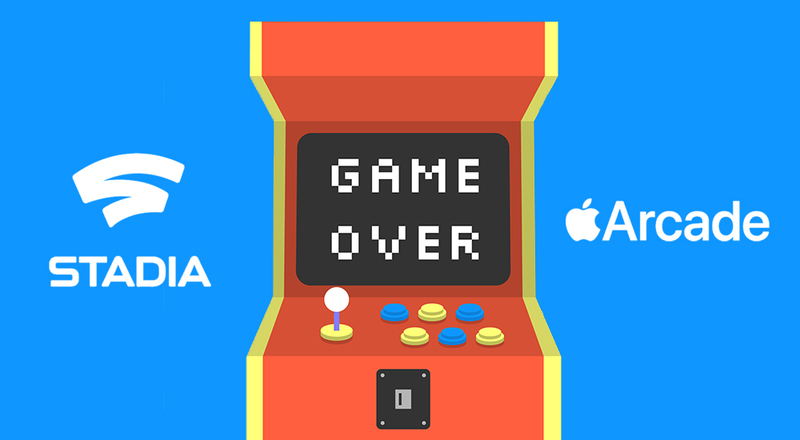 Apple were hot on their heels and have since announced their own version, Apple Arcade to compete. Both are game streaming systems that offer users a subscription service in which they can stream AAA games wherever they want and when they want across all types of screens i.e. phone, tablet and TV. They offer an instant play platform where users will not have to wait for their games to download or update, they will not be distracted by adverts and will not have in-app purchases. Apple have already stated that Arcade will be available from Autumn 2019 in the UK whereas Google Stadia hasn’t confirmed an exact time, they have simply said it will be coming to the US, Canada, The UK and most of Europe in 2019. Neither of the two have confirmed the cost for their subscription services, however, when we take a look at similar gaming services i.e. Sony’s PlayStation Now which is currently charging £12.99/month or Microsoft’s Xbox Game Pass which is £7.99/month we would imagine their pricing would sit somewhere along these lines. We do know that Google Stadia are also going to be releasing a controller to use with the service too so that would presumably come at an extra cost. Streaming games through a subscription service could be the future, taking into consideration that 58% of UK households own a tablet and 78% of adults own a smartphone whereas the sales of gaming consoles have plateaued.